This last week has been so much fun! I have loved being a guest over at My Favorite Things! Today is my last post and I have 3 projects to share. 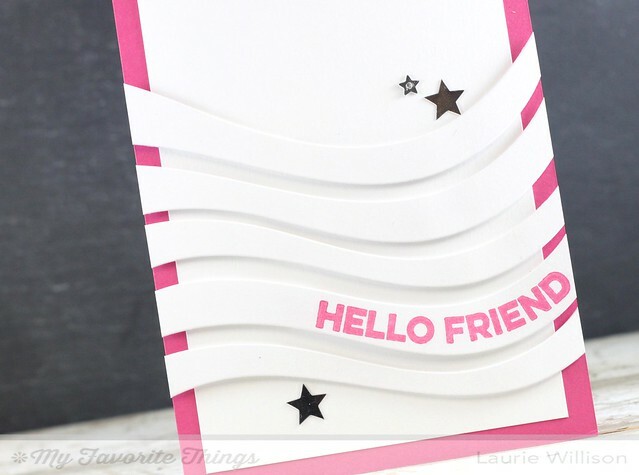 This first card uses the Ride the Wave Die-namics and the Wavy Greetings Stamp set. First off, I numbered all the dies with a permanent marker on the back so I could cut them in order. I cut them all out in white yardstick and then stamped the sentiment in Ripe Raspberry. I popped the waves up on foam tape and centered them on white card front, after I attached the white card front to the Ripe Raspberry card base. I added in some little star sequins for some shine. 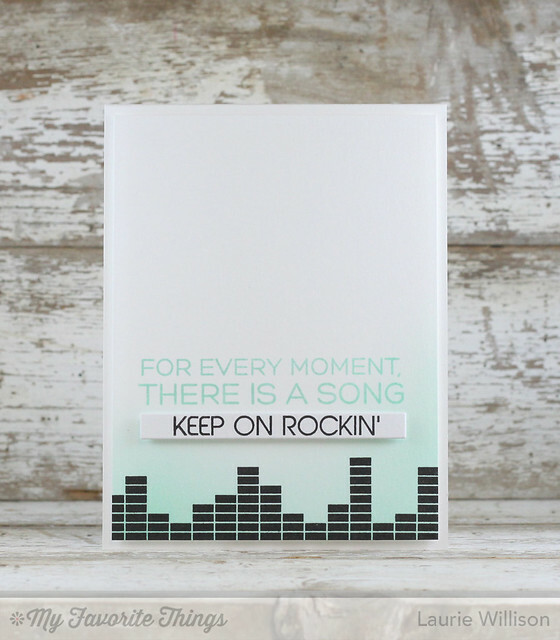 This next card uses the new set called Keep on Rockin stamp set. I used some teal ink blended on the bottom of the card base and then stamped the image on top in black ink. I stamped the sentiment in the same teal ink and then popped up the black sentiment on foam tape. This last card uses the Love die with a little blue ink blended in behind. I stamped the sprinkled with in Ripe Raspberry and then added a little Fishtail Banner on the top with a mini donut attached. Thank you all so much for coming by my blog this last week. You have left the sweetest comments and have definitely made my week. Thanks so much to MFT for having me along for this February Release! Stop over to the MFT blog for more details about today's release! Nice job with those new items. Fabulous, Laurie! I especially love how you've used the colours in your "every moment" card, dark and light and so well balanced! Fabulous cards Laurie. What awesome new releases. 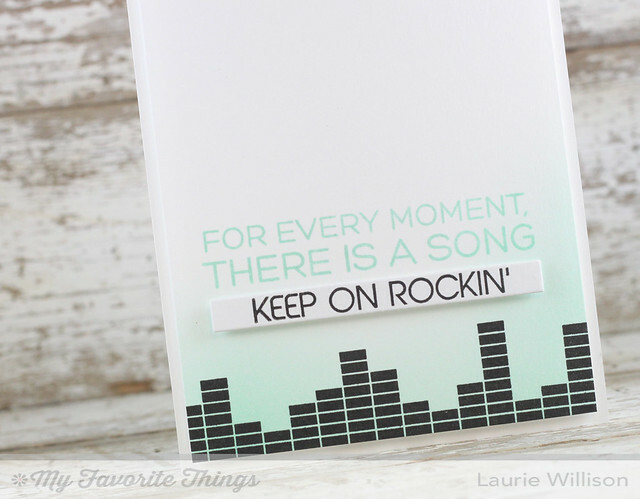 ...rockin' it, rockin' it, baby, baby, baby... YOU rocked these cards, Laurie!!! Wonderful cards, I really love that second one! Perfect inking! Gorgeous cards!! Thanks for sharing this month. These are all just terrific Laurie!! Really enjoyed seeing your creations! Love that pink and white with your waves, that blending is amazing and perfect for your second card, and love the colors and CAS design of the third! Awesome creations, Laurie!!! I especially love the second one. The inking is fabulous, and the sentiment is so true! Music creates strong memories! And so often I find songs popping into my head that relate to some situation I'm in or something I've seen or heard. Like when Tony and I were nearing the summit of our first 14'er together and you basically just have to climb your way up over boulders and scree---there's no real trail---you just choose your own adventure. Anywho...I started singing Fleetwood Mack----"You can go your own way......go your own wa-aayy..." Tony was rather irritated that I was able to sing at that point in the hike, but once we reached the top he thought it was funnier! HA! Your cards are simply stunning, Laurie!! !